Not that sitting on the floor on public places like squares is big news but in Gracia quarter for some reason it is almost the usual thing to do. Not that everyone there is a hippie or an "alternativo". Not that all of them are tourists that couldn't care less about local good manners. Possibly not that there's an evident lack of urban furniture to accommodate everybody. The fact is, it is a concoction, a sweet blend, of all that plus an extra additive of cultural engagement and adaptation to the Gracia environment, a living organism that models up its neighbors according to its historical background. In a certain way, that's the good thing about this part of town. 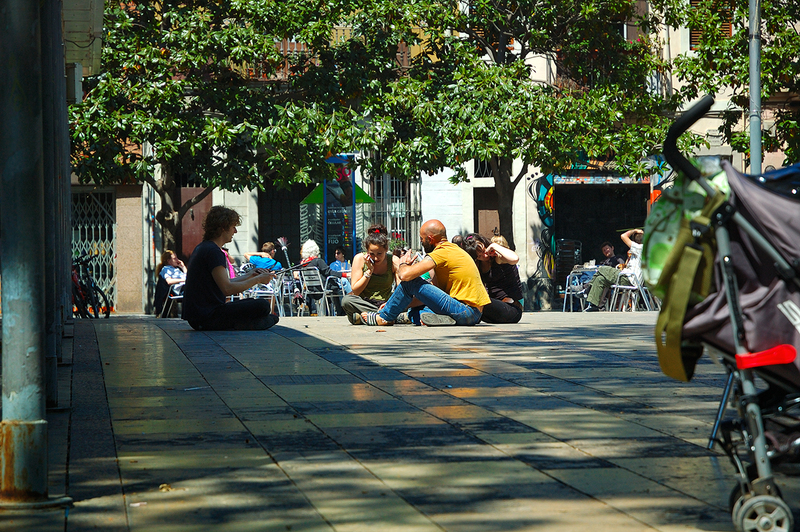 Gràcia is a multicultural melting pot with a passion for art, for culture and social cohesion. We are not going to Gracia very often (yet), but yeah, we couldn't fail to notice this blend... I was on Plaza del Sol yesterday morning in fact, but I confess, having a coffee in one of the bars, I was sitting on a chair. I prefer the chair but no problem with the environment. It is a great place to visit. Thanks R & M.
Agree with you about the increase in "sitting on the ground" - as it can be sighted as well here in Athens. However your ground seems to be much cleaner ! A nice Thursday for you. I love this blog. I'm going to travel to Barcelona on Oct 9th-14th. It have been my biggest dream in my whole life because I love Spain! (I like its culture and language very much).